Home→Angie and the Farmer Live! Angie and the Farmer Live! 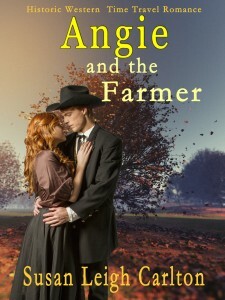 Angie and the Farmer Angie is a western historical Oregon Trail Romance of 39,000 words, or around 150 pages. It is a clean story with one non-explicit sexual scene between a married couple. The heat level is 2 or rated GP. Angie Thornton met Jed Lewis after being swept downstream in a flash flood. She was found by a small boy from a nearby wagon train on a tree limb beside a creek. Jed Lewis, the eighteen year old son of one the rescuers, was immediately smitten when she first came to the train. With 2,000 miles remaining on the Oregon Trail, will Angie be able to overcome her reluctance to accept help? Can she find love with Jed, a farm boy from Ohio? What did either of them have to do with an iPhone found in a 90 year old grave? If you like Angie and the Farmer, a review would be greatly appreciated. As always, your feedback is also appreciated.